Are they great friends? Time will tell, as rumors have floated about ambassadorships, not to mention Yeezy’s own presidential bid, presently pushed from 2020 to 2024, assuming we make it that long. In the meantime, you, too, can catch a whiff of the gold-crusted opulence of our glorious leader-elect with the website youareagreatfriendthanks.com, which allows you to get your own cover, or a cover for anyone else. 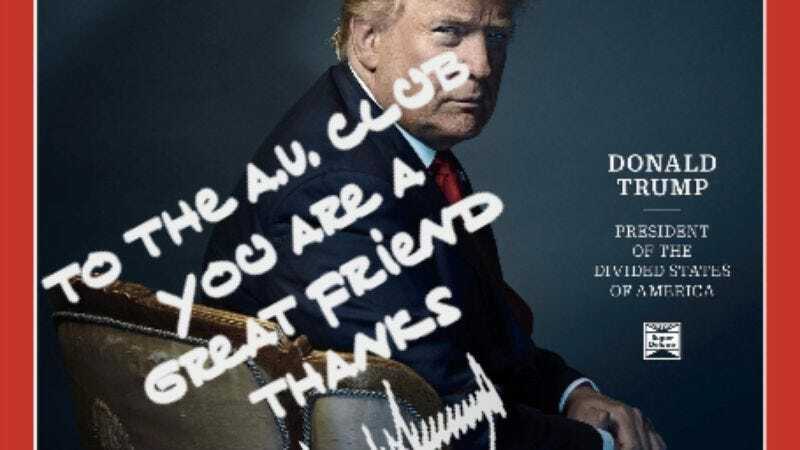 One quibble: The site doesn’t quite replicate Trump’s handwriting as it appears in Kanye’s photo, in particular the shocking way the “T” in “Thanks” underlines “great,” a stylistic choice which is actually sort of impressive. Had he been practicing that?